A ceremony was held in Dublin to remember Joseph Pierce Murphy, one of the first Irishmen to die in World War I. A special plaque was unveiled to Joseph Pierce Murphy, who was 25 years old when he died 100 years ago today. 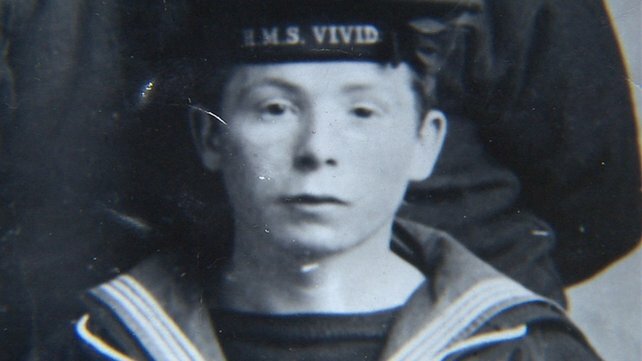 Joseph Pierce Murphy of Ringsend Dublin died on the 6th.August 1914 when the Cruiser Amphion sank in the North Sea, (The first Royal Navy ship to be lost in action) he along with 13 other Irish men were among the first from Ireland to die in World War 1. Seven of them were from Cork. In the year 1803 sir william Dillon was posted to Hull as Second in Command of the impressment Service at that port. The Impressment Service was the dignified name which the authorities gave to the better known press gangs which operated to force men into joining the naval service At the time in question the British merchant service held a far greater attraction for seamen than did the navy. For one thing a seaman in the merchant marine received 30/- per month as against 19/- if he served in the navy. There was also the fact that the merchant vessels had become very numerous and most of the experienced seamen were attached to merchant ships. With the outbreak of war with France in 1803 the need for men to serve on naval vessels was very great and despite the bounty paid to men who would join, the problem created by the shortage of men was not solved. For that reason the authorities resorted to the system of 'Impressment' and so the press gangs became more active at this period than at any other time in history. When Dillon was posted to Hull he found that his superior officer was an elderly man who was quite happy to sit in his office and leave the "dirty work'' of organising the press gangs to Dillon himself. A job like this was distasteful to any officer, but Dillon's loyalty to the service and his devotion to duty made him efficient in the work he had to do. Officers in charge of press gangs were called 'yellow admirals', a term which was used to denote the officers' quarantine in a dead end job. Contrary to popular belief the actions of the press gangs were very much restricted by the legal exemptions from "impressment". All persons under 18 years of age and over 55 years of age were exempt; seamen with less than two years of seagoing experience were exempt and in the case of apprentices those with less than three years experience were also exempt. While the press gangs found that their efforts to obtain men on the high seas were more fruitful than their raids ashore, out bound vessels could not be approached by them. In the case of inward bound vessels the press gangs were required by law to leave sufficient men on board to ensure the merchant vessel safe navigation to her anchorage and a safe berthing. Masters, Chief Mates, Boatswains and Carpenters on ships of 50 tons deadweight or over could not be taken either. Pilots too were exempt unless an unfortunate Pilot happened to run a ship aground. As a result of all these exemptions the number of men available for impressment" was considerably reduced and the records for 1803 show that of the total men obtained for the navy, 37,000 were volunteers as against 2,000 of pressed" men. In addition to the small number of men obtained through the action of the press gangs, the quality of the men"impressed" was very poor and most of the naval officers who were obliged to take these men complained bitterly of the low type of men with which they had to contend. Despite the high rating of Irish men serving in the British merchant and naval service, the press gangs operated to a limited extent in this country. It is oF interest to note that the percentage of officers supplied at that time than the percentage from any their arrival at the public house they discovered a wake in progress. However the high spirited nature of the festivities going on in the house made the officer in charge doubtful of the sincerity of the mourners. His suspicions were roused to such an extent that he ordered the coffin to be opened. Whereupon the ‘corpse” popped up his head and leaped out of the coffin with a shriek of laughter. Subsequently the recently “deceasEd” quite willingly accompanied his captors and turned out to be an excellent Seaman. 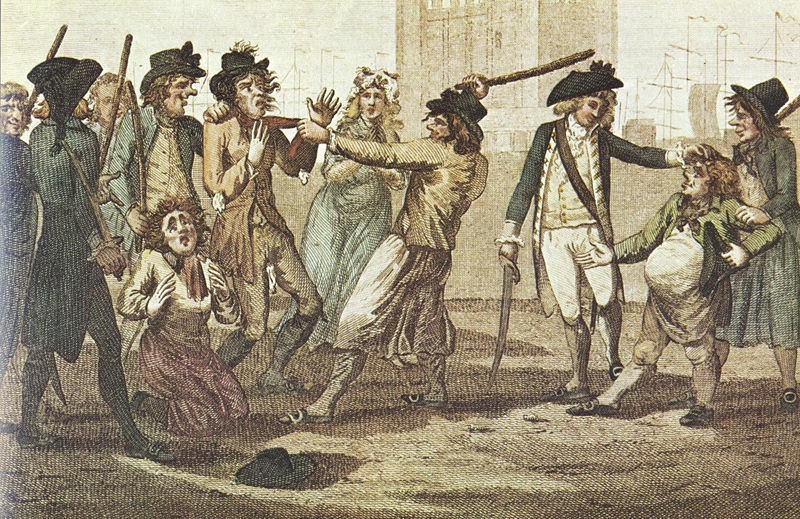 Public opinion was very much against the press gangs and whenever an appeal was made to the Courts against the decision of the press gangs the judges invariably ruled in favour of the victims, The weight of public opinion, together with the limited success of the system of “impressment’ eventually lead to the dis­appearance of the press gangs. Few people mourned their passing, but, nevertheless,to­day in countries which are faced with the problem of providing large defence or military forces, the system of conscription which is in itself a form of ‘‘impressment’’ still persists. We can only hope that the fear of war which makes for coercion of this nature will itself disappear and that men will acknowledge, in time, the futility of war. 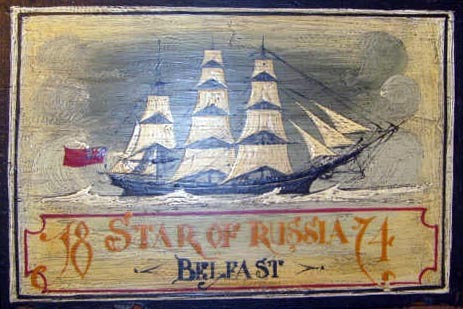 THE IRISH STARS WERE FAMOUS SAILING SHIPS OWNED AND OPERATED BY THE BELFAST FIRM OF J.P.CORRY & CO. IN THE LATE 19th. CENTURY. THE FIRST OF THE "STAR" SHIPS WAS THE "STAR OF ERIN" AT 949 G.TONS. ALL BUILT BY HARLAND & WOLFF IN BELFAST. THEY RANGED IN SIZE FROM THE STAR OF ERIN AT 949 TONS TO THE STAR OF RUSSIA AT 1892 TONS. 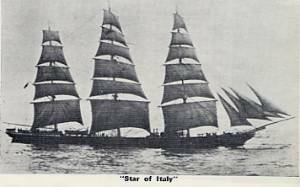 THE LAST IRISH STAR WAS BUILT BY WORKMAN,CLARK & CO. OF BELFAST AND NAMED THE STAR OF AUSTRIA WITH A GROSS TONNAGE OF 1693 TONS AND 265ft. IN LENGTH. IN 1874 THE STAR OF BENGAL SAILED TO MELBOURNE ON HER MAIDEN VOYAGE IN 81 DAYS, ON TO SAN FRANCISCO IN 58 DAYS AND BACK TO LIVERPOOL IN 111 DAYS. IN 1888 THE STAR OF PERSIA SAILED TO MELBOURNE IN 76 DAYS. BUT THESE LONG VOYAGES WEREN'T WITHOUT THEIR DANGERS!!. IN 1886 THE STAR OF ALBION WAS WRECKED ON THE BANKS OF THE HOOGHLY RIVER, THE STAR OF SCOTIA WAS LOST ON THE COAST OF THE FALKLAND ISLANDS WITH THE LOST OF 7 CREW, AND IN 1888 THE STAR OF GREECE HAVING MADE THE TRIP TO AUSTRALIA IN 86 DAYS WENT AGROUND ON HER RETURN VOYAGE WITH THE LOST OF CAPTAIN HARROWER AND HIS CREW. J.P.CORRY & CO. LOST ITS IDENTITY IN THE FEDERAL CUNARD COMBINATION IN 1898 AND WENT OUT OF BUSINESS. MANY OFTHEIR SHIPS WERE PASSED ONTO THE ALASKA PACKERS ASSOCIATION OF SAN FRANCISCO. "THERE WILL ALWAYS BE A SPECIAL PLACE IN THE MARITIMEHISTORY OF IRELAND FOR THOSE LOVELY IRISH STARS".